we address this letter to you as we have noticed a "Hitler PEZ Dispenser" on your website. As this "Hitler PEZ Dispenser" is a self-made fake dispenser, against any humor or taste, not affiliated with PEZ and furthermore an obvious infringement of various statutes and rights, including intellectual property, plus an insult, we do ask you to instantly remove this photo and any article plus reference to the "Hitler PEZ Dispenser" from your website. 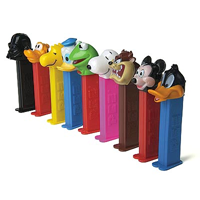 Any future display of any such fake and/or insulting PEZ items shall be refrained from. We may set a deadline till May 15th, 2009, and do ask for your immediate cooperation in this regard, as otherwise legal measures have to be taken. in reviewing your website again we have now noticed a fake "Charles Manson" PEZ Dispenser, which has to be removed as well from the homepage - we may also set a deadline till May 15th, 2009, and do ask for your immediate cooperation in this regard, as otherwise legal measures have to be taken. A possible lawsuit or at least a threat.